Yellowed fabric quickens their pulses. A metal zipper sewn into the side of a modestly styled dress gets their hearts racing. A hand-sewn label from Taiwan dampens their palms. Orlando’s most active vintage collectors see estate sales the way adventurers see mountains they’re about to scale. 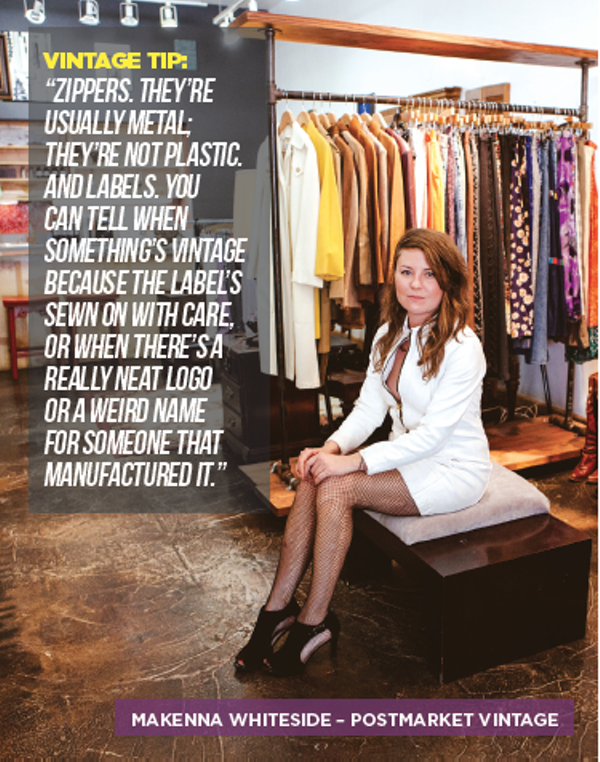 And when they emerge from the clouds of dust they stir up, they’ve got bushels of clothing underarm that frequently necessitate a second, or even third, trip to deliver the delicate, hand-picked garments to the boutiques and vintage shops peppered throughout our city. “I think I just grew up in a creative home and understood how to hunt for things and how to repurpose them or paint them up and make them look new again, which when it comes to vintage furniture and vintage artwork and vintage clothing, it’s just about seeing what it can be,” says Falon Quillen, owner of Etoile Boutique in the Milk District, which recently expanded to open a second location in Adjectives Market in Winter Park Village. The interest in vintage in recent years has spiked, thanks to trendy sites like Etsy where young online shoppers can peruse an assortment of genuine vintage articles as well as reproductions, like the clothing made popular by sites like Modcloth. 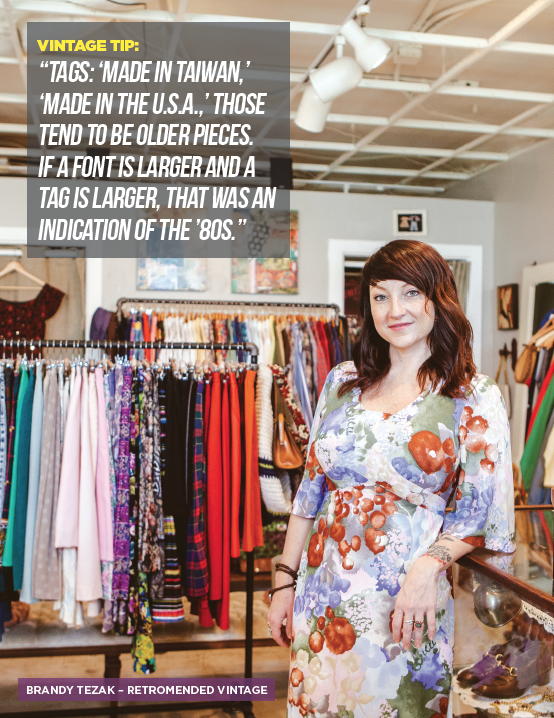 Modcloth actually shared an online marketplace initially with longtime vintage purveyor Lisa Smith of Orlando Vintage Clothing & Costumes, whose shop celebrates 20 years in 2015. Unlike Modcloth, though, Smith is loyal to authentic vintage, as the gorgeous racks that line her store on Fairbanks Avenue demonstrate. 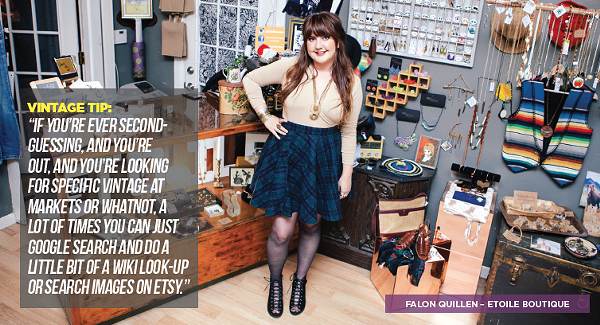 She remembers a time when the vintage market, both locally and online, was much more niche. When she opened her shop, Déjà Vu Vintage Clothing and Accessories was the only competitor around that still exists today. Déjà Vu celebrates a landmark anniversary this year as well: 30 years. 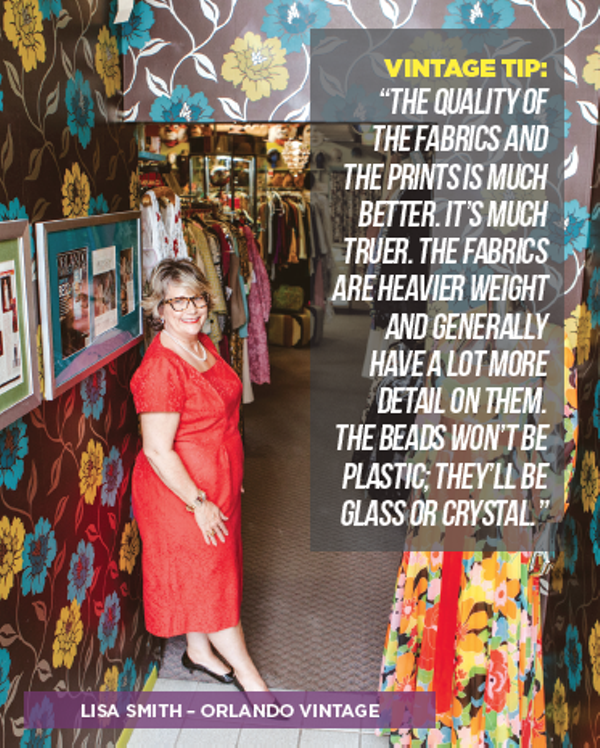 Many who were around back then will likely remember when Déjà Vu opened in the former space of one of Orlando’s well-known original vintage stores, the Pink Flamingo. In the current climate, you can find a vintage shop in nearly every hip neighborhood, with Etoile Boutique in the Milk District, Retromended in Ivanhoe Village and Postmarket Vintage in the brand-new Audubon Park market, the Lovely. Winter Park is perhaps most spoiled, with three vintage stores within its bounds – a second location of Etoile is open at Adjectives Market in Winter Park Village, Orlando Vintage holds down Fairbanks (also teasingly neighboring College Park) and Owl’s Attic can be found nearer to the college crowds at Full Sail University and University of Central Florida. And while Ivanhoe Village lost Déjà Vu a little over a year ago when the shop had to relocate, Mills 50 benefited, as Orlando’s oldest vintage shop scooted closer to the fast-developing district, reopening its doors on 17-92. 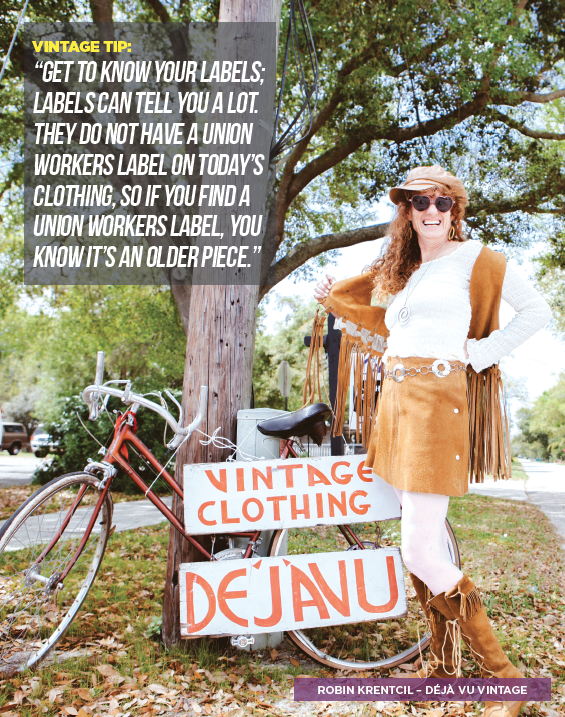 Whiteside touches on a pretty important distinction that separates the new class of vintage shops from the old-school collections presented by Déjà Vu and Orlando Vintage. At Etoile, Postmarket Vintage and Retromended, a shopper is more likely to find wearable garments that can more conveniently be inserted casually into a wardrobe, unlike the showstopper pieces at the older shops that draw the eyes of major film studios, national ad campaigns and anyone looking for a costume for a theme party. And they never forgot, especially since Smith makes it a point to show her collection in New York once a year. She’ll be showcasing at the Manhattan Vintage Clothing Show in New York this October, where fashion obsessives like Sofia Coppola, Bette Midler and Tory Burch shop for inspiration. Similarly, Krentcil says she has three autograph books from celebrities she’s styled over the past eight years, and the theme parks also come to her with vintage needs. As for Retromended’s Brandy Tezak, she’s helped style local theater productions, as well as wedding magazine shoots and local ceremonies (Retromended is also styling Orlando Weekly‘s events team for our upcoming 1920s-themed Great Orlando Mixer event). Not only do these opportunities allow the vintage collectors to diversify their methods of generating income, but they also are some of the most rewarding. Although each shop has its own unique story (click the links under each photo to read full profiles of each shop featured here), the common thread through each of these shopkeepers’ tales seems to be as serendipitous as the clothing they discover rooting through what many would foolishly consider depressing old hand-me-downs. Each woman found her interest in the ambitions she’d originally planned began dwindling – Smith was in broadcasting, Krentcil was an electrician’s apprentice, Tezak was in finance, Whiteside was indifferent to Orlando initially, Quillen was a hairstylist and jewelry designer – and the allure of thrifting for vintage clothing became as persistent as the clothing itself, which has been fashioned to last for decades and decades. 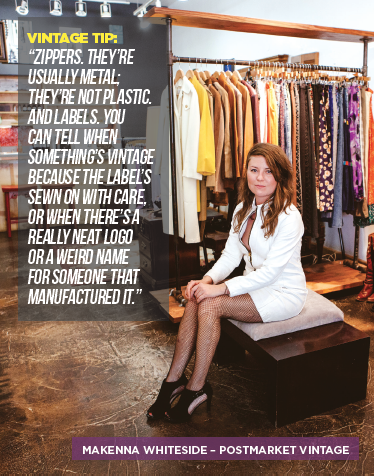 It’s a longevity that Orlando’s older vintage shops have already attained and the newer shops aspire to achieve. But where there’s a one-of-a-kind garment to be found, there’s likely to be that diamond-in-the-rough-seeking customer.